It hasn’t been a great season in Edmonton. 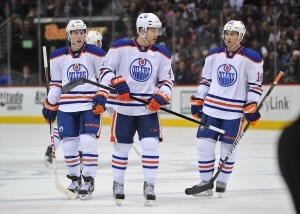 After two consecutive last place finishes, the young Oilers were hoping they had enough to at least contend for a playoff spot. The team had a decent start, but inconsistency, injuries and holes in the roster derailed their season. A 29th overall finish, while technically an improvement, isn’t sitting well with the players and management. While other teams prepare for the playoffs to begin, the Oilers are looking toward tomorrows draft lottery, where they still have a chance to get another first overall pick. The team lost 5 of their last 6 games, but have been mathematically out of the playoff picture for a while. The Oilers have a very skilled set of forwards. Taylor Hall, Jordan Eberle, Ryan Nugent-Hopkins, and Ales Hemsky all have the tools to light it up, but offense can only carry a team so far. The defense simply wasn’t good enough. Goaltending wasn’t terrible, Devan Dubnyk had decent numbers on a bad team, finishing the year with a 2.67 goals against average and .914 save percentage while appearing in 47 games. Is he the goalie of the future in Edmonton? That remains to be seen. Veteran Nikolai Khabibulin has one year left on his contract, so there are still some question marks in net. The Oilers also had a solid mix of veterans this season with the likes of Ryan Smyth, Eric Belanger and Andy Sutton, but it wasn’t enough. Without a doubt, the team needs to add a top flight defenceman, either through the draft, trade or free agency. The uncertainly surrounding the new CBA makes any possible deals this summer all the more difficult. But, the Oilers have some great pieces in place compared to a lot of the teams around them. They have strong prospects, and young stars who are only going to get better. The Oilers players provided some great quotes as they packed up their stalls for the summer. For some of them, it may be their last day in the Edmonton dressing room. The players are disappointed, management is disappointed, and everyone is ready to take that next step forward. Oilers fans should be excited, because there are a lot of positives surrounding this team regardless of another lost season.